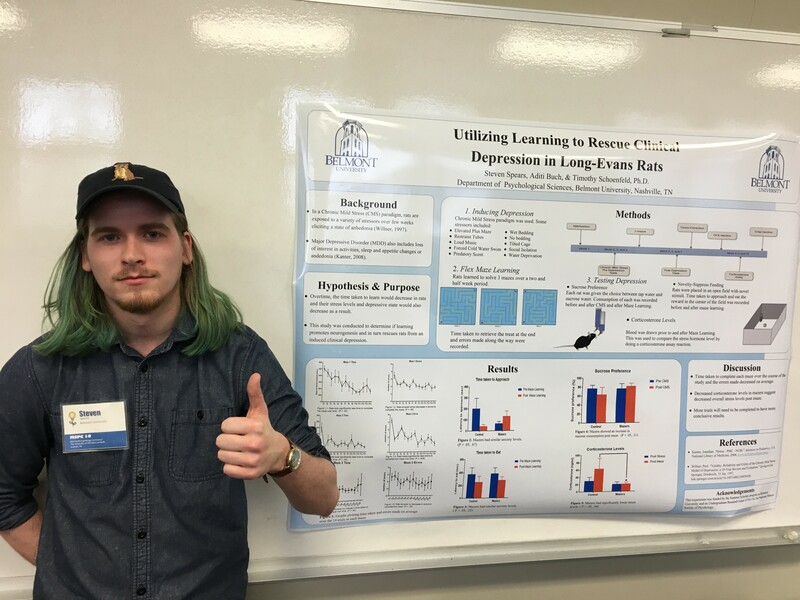 Psychology major Steven Spears recently presented research he conducted over the summer as part of Belmont’s Summer Scholars program at the Mid South Psychology Conference in Jackson, Tennessee. The project, “Utilizing Learning to Treat Clinical Depression in Long-Evans Rats”, advised by faculty mentor Dr. Timothy Schoenfeld (Psychological Science), investigated the role of flexibility training to rescue rats from a chronic stress-induced behavioral state resembling depression. Schoenfeld and Spears attended a full day of talks across psychological science at the conference, including work on anxiety, mindfulness, drug usage, and new topics like growing fandom.